5432…MeetUs! 2016 – Another Success! – 5432 … Meet us! but we’re happy it happened! everyone that made it possible! of PostgreSQL and everything in between, there was something for everyone in attendance. to prepare and share their knowledge with everyone present! Didn’t get a chance to catch one of the talks? No worries! Check them out now! section under the respective talk. to the way they approach their work. 2ndQuadrant’s Gianni Ciolli showed off his love for High Availability with a crash course on Repmgr. 2ndQuadrant Italia’s Marco Nenciarini focused on PostgreSQL in his workshops by reviewing Docker and teaming up with Andrea Vercellini of IBM to set up PostgreSQL on Power. Last but certainly not least was the Raspberry Pi workshop with Rubens Souza of 2ndQuadrant Italia – participants had the opportunity to experiment with Raspberry Pis by learning to set up the PostgreSQL platform on them. Many professional relationships and friendships were made at the conference during the recruiting sessions, coffee breaks, and aperitivo. It provided participants with a chance to relax between talks and mingle with other attendees. To see more comments and photos from the event, check out the 5432…MeetUs! 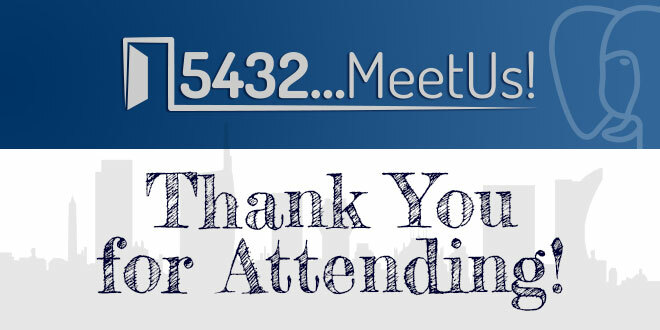 we look forward to seeing you at the next edition of the 5432…MeetUs! conference!